The high power fiber lasers commercialized by IDIL Fibres Optiques are built around the design of a Distributed Feed Back laser (DFB laser). 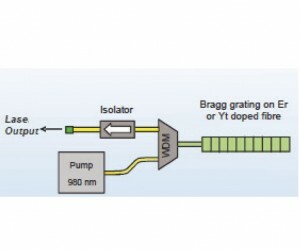 They use an Erbium or Ytterbium doped fiber on which a FBG (Fiber Bragg Grating) is written. By construction, this laser is naturally single-frequency. 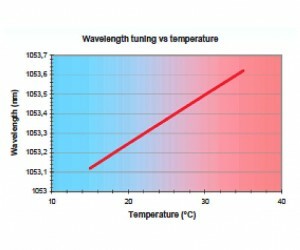 Such type of laser is then also tunable, via thermal control over several nm without any mode hopping. It is pumped, thanks a multiplexer, by a laser diode operating @ 980 nm. The optical output is isolated in order to avoid any light feedback which could pertubate the laser. A PM type is also available. The driver integrates three main functions : the power and temperature stabilisation of the pump laser diode, the temperature stabilisation of the DFB laser via a Proportional Integral and Derivative electronic for setting the right wavelength and the output power controller for the pump laser diode and DFB itself (drift management). Two output power diagnostics are available. RS232 version is available only on benchtop laser.